LAHORE: (Wednesday, October 10, 2018): Punjab Higher Education Minister Raja Yasir Humayun Sarfraz has said that the government has kept higher education on priority and all institutions of higher learning would be made centre of excellence in research. 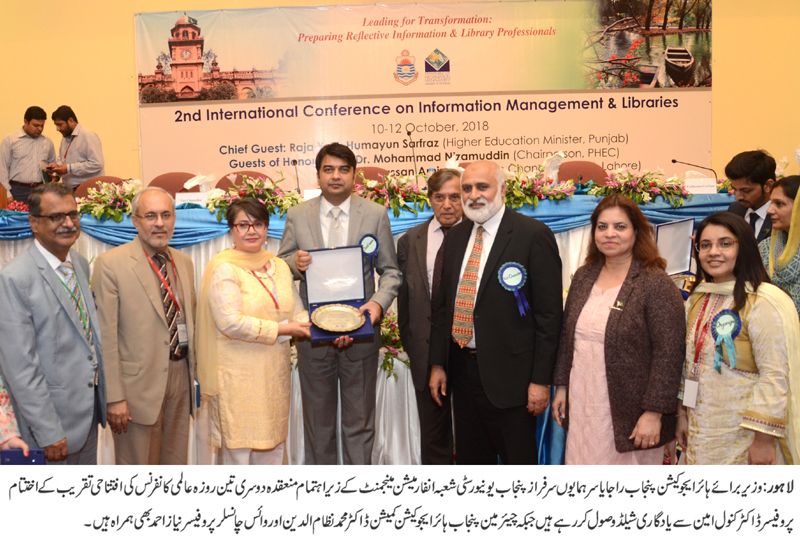 He was addressing the inaugural session of 3-day second international conference on “Information Management and Libraries (ICIML)” organized by Punjab University Department of Information Management at University Law College’s auditorium here on Wednesday. Punjab Higher Education Commission Chairman Prof Dr Nizamuddin, PU Vice Chancellor Prof Niaz Ahmad Akhter, DoIM Chairman Prof Dr Khalid Mahmood, Conference Chair Prof Dr Kanwal Amin, more than 400 delegates from USA, UK, Malaysia, Kenya, Kuwait, India, Iran and from various parts of Pakistan and a large number of students participated in the conference. Addressing the conference, Raja Yasir Humayun said that due to latest technological developments, the sources of getting information had changed. He said that the learning the art of getting access to appropriate information play role in becoming a good researcher. He said that there was need to train our librarians as their role had become important for researchers in doing quality research. He said that the government would set up new institutions for promotion of research in the province. Addressing the ceremony, PHEC Chairman Prof Dr Nizamuddin said that around 450 posts of librarians are lying vacant in Punjab. He said that the concept of libraries had changed now and the new concept of cybraries had developed. He said that we must have trained information officers in the libraries who could apprise researchers of latest techniques in accessing data. 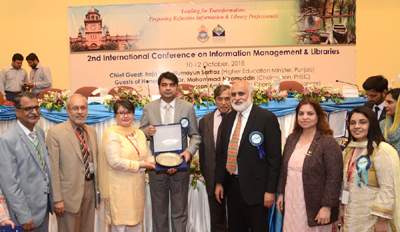 He said that information management should be part of curriculum in all subjects. He said that all information resources must be networked for the benefit of researchers. Addressing the ceremony, Prof Niaz Ahmed said that the administration was committed to upgrade this department because of its growing importance. He said that PU administration was quality conscious and would provide quality professionals and services in this field. He said that the curriculum of the subject would also be revised to accommodate latest developments in the field. He said that our libraries must have an environment which could attract readers. He called upon the conference delegates to prepare fruitful recommendations for the betterment of this subject. 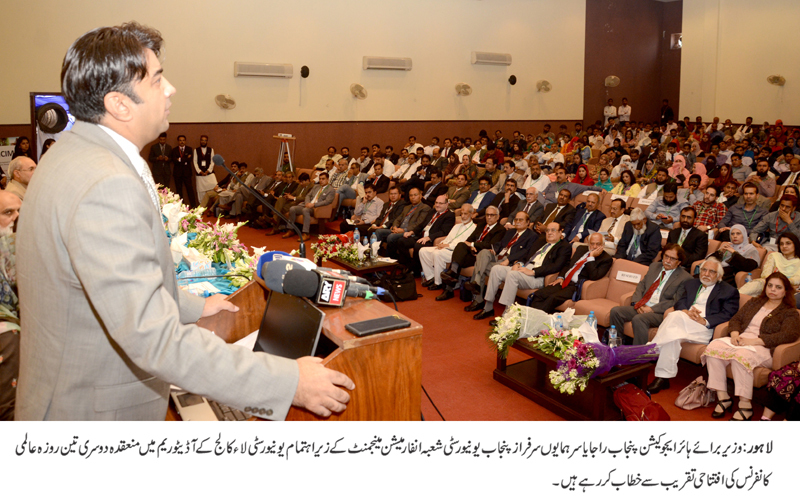 DoIM Chairman Dr Khalid Mahmood said that PU would contribute to the government in different projects in its own way. 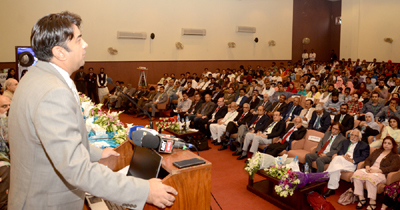 He said that we would extend full support to the government for building new Pakistan and develop culture of research.